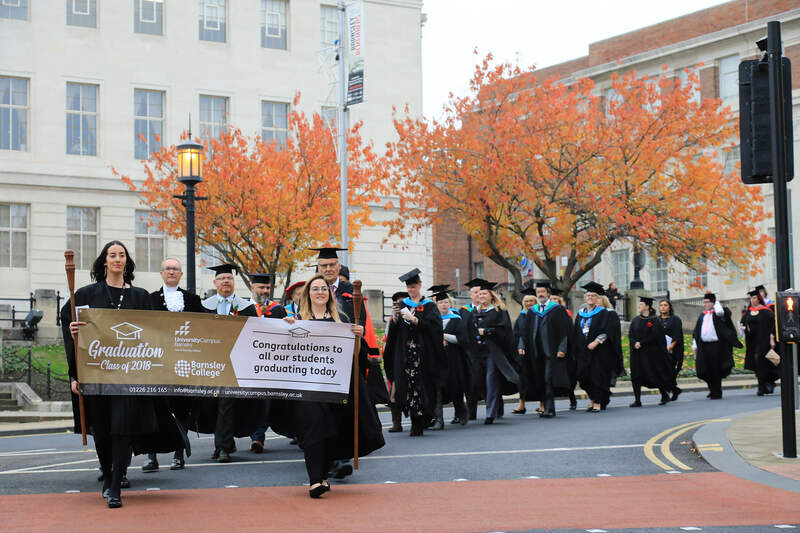 Our students from University Campus Barnsley (UCB) and Barnsley College have been honoured in this year’s Graduation ceremonies. Led by a local brass band, they processed from UCB on Church Street to The Civic with many members of the public and local businesses lining the streets to support them as they processed. The ceremonies, for our students who have completed Higher Education courses over the last year, was attended by graduands, their guests and VIPs including senior College staff, The Worshipful the Mayor of Barnsley Cllr Steven Green, the High Sheriff of South Yorkshire Mr Barry Eldred and the Deputy Lieutenant Mr John Foster MBE with entertainment on the day being provided by our very own Music students. Dr Louise Ellis, former Barnsley College student and Director of Sustainability Services at the University of Leeds gave an inspiring and thought provoking keynote speech as she shared her own experience of studying and working internationally. She spoke of the importance of seeking out opportunities beyond peoples’ comfort zones and an ‘It’s never too late’ attitude to learning. Liz Leek, Vice Principal of Students, congratulated each and every graduand as she presented them to Barnsley College Principal and Chief Executive Officer, Christopher Webb and Chair of Governors, Simon Perryman to receive their awards.